The use of corporate social media such as Facebook, Twitter, LinkedIn, YouTube and Blogging is about utilizing technology for efficiency and effectiveness for better results. And that's where Spit Digital Creative comes in. It's not a social trend – it’s the use of a technology platform to get better results, communicate with your customers and get realtime feedback. So what does that mean? 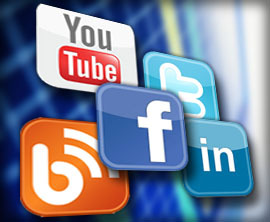 It means social media is a growing part of a company’s marketing strategy. Let us implement it into your company's marketing strategy and allow your visitors to connect with you so your team can be more engaged with your customers.